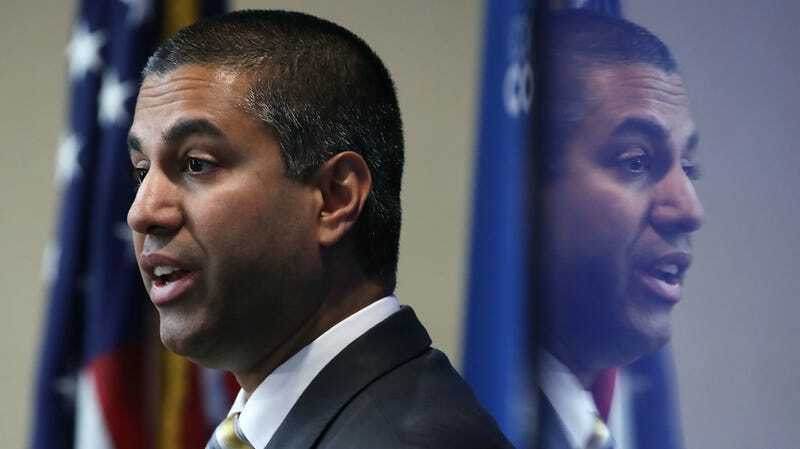 FCC Chairman Ajit Pai speaks during a news conference to unveil Cox Connect2Compete program, at the National Press Club, on October 1, 2018 in Washington, DC. The award was bestowed by the Daily Caller News Foundation—the non-profit branch of Fox News host Tucker Carlson’s Daily Caller news site—citing various threats that Pai and his family received this year amid the fierce public discourse over net neutrality. The invite-only ceremony was said to be hastily assembled at the Mayflower Hotel in Washington D.C., following the funeral of former president George H.W. Bush. In May, federal authorities arrested a suspect accused of calling in a bomb threat during the December 2017 net neutrality vote. Another man was arrested in June and charged with email death threats to Pai, one of which accompanied a photo of the chairman’s family and made references to their location. Protesters were also accused of crossing a line when they posted signs outside his home that featured the names of his children. Wednesday’s event had been planned prior to the death of the 41st president. Organizers quickly threw together a tribute to Bush to include at the start of the event, which they said could not be canceled last minute. “A lot of people there had been at a funeral all day, so things were quieter,” Daily Caller’s editor-in-chief, Christopher Bedford, said by phone. Interior Secretary Ryan Zinke was also recognized by the Daily Caller foundation. And White House Chief of Staff John Kelly was among those in the audience, an attendee told Gizmodo. At the Conservative Political Action Conference in February, Pai received an award from the National Rifle Association; the Charlton Heston Courage Under Fire Award, named for the actor and former NRA president, which is actually a handmade long gun. (For security reasons, the gun wasn’t allowed on stage.) Pai later turned down the award on advice of ethics officials. Pai’s charge to repeal the 2015 Open Internet Order, the net neutrality rules enacted under former Chairman Tom Wheeler, drew unprecedented levels of public attention over the past year. The undertaking, which concluded with the order being formally repealed in June, has been widely condemned by digital rights organizations. The chairman, meanwhile, claims the 2015 order was stifling internet innovation and that his new, “light-touch” approach would encourage it. Pai is widely recognized as one of the most effective soldiers in the Trump administration’s anti-regulatory offensive, which has seen heaps of rules purged at the Environmental Protection Agency and Departments of Labor, Commerce, Transportation, and Education, among others. But even the rollback of Obama-era pollution rules aimed at bolstering a declining coal industry, which may contribute to over a thousand deaths per year, according to the Trump administration’s own analysis, has not seen as fearsome a public debate as net neutrality. Net neutrality is the principle that internet providers treat all data delivered to customers equally. Proponents have long warned that, without government rules in place, internet providers are likely to engage in predatory practices, such as limiting subscribers’ access to competing online services. Other fears include the creation of a two-tiered system in which certain companies are granted exclusive access to higher internet speeds, leaving startups and small businesses in the dust. Despite top ISPs intermittently engaging in the very kind of discriminatory behavior net neutrality is designed to prevent, and though major ones like Verizon have publicly expressed interested in establishing “fast lanes” for profit, Pai and his supporters point to the fact that there’s been little change in how consumers receive internet service as proof that the Obama-era rules were, at best, unnecessary, and at worst, hindering innovation (often ignoring evidence to the contrary). However, the FCC’s decision—which fell 3-2 along party lines—is still being argued in the D.C. Court of Appeals. And telecom experts say that, meanwhile, it is unlikely providers would do anything drastic that might influence the case’s outcome. Scrutiny of Pai’s office will intensify next year as Democrats take control of the U.S. House of Representatives. Chiefly, control of the House Energy & Commerce Committee, which provides oversight of the FCC, will soon fall to the current ranking member, Frank Pallone, Jr., a Democrat of New Jersey. Democratic sources say the list of issues to be raised with Pai is long, largely due to the fact that his office has refused to acknowledge most requests for information without an order from the present Republican majority. Questions about instability in the FCC’s comment system, which Pai said publicly this week saw a flood of fraudulent activity (including comments linked to Russian accounts), are high on the list. In early 2017, Republicans suggested that they would hold quarterly oversight hearings for the FCC; however, only three were held over the past two years. With Democrats at the helm, the chairman is likely to enjoy (or probably not) a significant uptick in C-SPAN screen time, giving him the opportunity to further test his courage.